Speed City Sisters in Crime is the Indiana chapter of the world-wide mystery/crime writers' association Sisters in Crime. The Speed City chapter was founded in 2005. Find out more about our organization. For folks who are members of Speed City Sisters in Crime - you are welcome to submit work to our next anthology. Anthology guidelines are here. On Saturday, April 27th, best-selling author Nancy Pickard is giving a free one-day writing workshop hosted by Speed City Sisters in Crime. Whether you're just starting to fulfill your secret wish to be a writer, or you're working on your 20th novel, you have in common with all of us the desire to be as good a writer as you can be. To write what you most want to write. To know the thrill and joy of having readers who love your work. So let's start at the beginning, as we all do with every story, and talk about the basics--characters, plot, voice, theme, all of it--in ways that will help and inspire you no matter where you are on your writing path. In this hands-on workshop, we'll dig into the components of storytelling, including action, conflict, settings, beginnings, middles, endings, and much, much more. Bring all the questions you've ever wanted to ask about writing fiction, and discover fresh, new ways to look at your own writing and re-writing. Writers often say, "Nobody understands me the way other writers do." So come spend an exciting and encouraging day with a whole roomful of other writers who know what it feels like to want, more than anything, to be the best writer they can be. Find out more about this workshop and how to reserve your seat here. As a special event in preparation for our next short story anthology, award-winning author Larry Sweazy will present a two-hour workshop on short story writing. The workshop will take place just after our monthly chapter meeting, which will begin an hour early at 10:30am. The workshop is open to members and guests. ​Larry D. Sweazy is a multiple-award author of fourteen western and mystery novels and over eighty nonfiction articles and short stories. He is also a freelance indexer and has written back-of-the-book indexes for over nine hundred books in twenty years. Larry lives in Noblesville, Indiana with his wife, Rose, two dogs, and one disagreeable cat. More information about Larry’s writing can be found at http://www.larrydsweazy.com. Critique Group and monthly meeting will start 1 hour early. 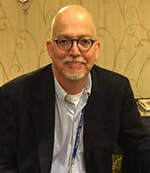 Jim will speak about online tools that help writers find markets for their work... predominantly Duotrope for short story writers, as well as other sources for novelists who might be looking for agents or publishers. ​Jim Naremore is a novelist and short story writer with a uniquely American background. Originally from Louisiana and the deep South, he has lived all over the country, mostly in the Midwest. Now living and working in Indianapolis, Indiana, Jim has been writing fiction seriously for the past twelve years. His debut novel: The Arts of Legerdemain as Taught by Ghosts (Belle Lutte Press, 2016) was awarded a bronze medal for “best first novel” by the Independent Publishers Book Awards and was a finalist and short listed for the Lascaux Prize. His short fiction has appeared in numerous journals, including Thrice, Typehouse, The Offbeat, and Emrys, among others. He is the 2019 recipient of the Dennis Lehane Fellowship. Under the name Rob Kent, he writes middle grade novels such as Banneker Bones And The Giant Robot Bees and Banneker Bones And The Alligator People. He runs the popular blog for writers, MIDDLE GRADE NINJA, which features interviews and guest posts from authors, literary agents, and other publishing professionals, and was the recipient of Middle Shelf Magazine's Best Blog award. He also hosts the Middle Grade Ninja podcast. Robert Kent holds degrees in Literature and Creative Writing from Indiana University and owns over 900 Batman action figures. He lives with his family in Indianapolis where he teaches courses at the Indiana Writers Center and is hard at work on his next book. newest anthology published December 2018.
with a forward by Lori Rader-Day. Published by Blue River Press. Watch for our upcoming book signings and events! And visit our anthologies page to see all of the anthologies produced by Speed City Sisters in Crime.